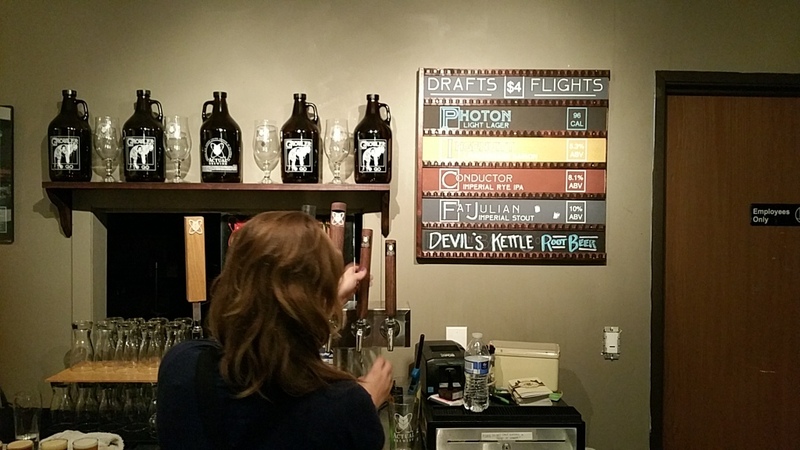 Having visited Pigskin Brewing Company in my hometown the other day, the next closest brewery is Actual Brewing Company. So, yesterday, I headed over there. Now, I thought they closed at midnight, but, apparently they close at 10pm. Having gotten my kids in bed around 9:30pm, I then hopped in the car and rushed over to make it into the tasting room before they closed. I arrived moments before their closing, but I was able to make it into their tasting room to order beer. They had four beers on-tap, so I ordered a flight of those four beers. I started off with the Photon (3.5% ABV), a light lager, which had slight honey notes on the nose, that carry throughout, and a bready palate, that also seemed pretty round and smooth. Next up was the Ingenuity (5.3% ABV), a lemongrass saison, which greatly featured banana & cloves nose and taste throughout (not sure if that was meant to be there…), but it was more pleasant than a typical hefeweizen. One worker there said they used some pilsner grains in this batch, yielding these flavors, but they’re not going to do it again. Next up was the Conductor (8.1% ABV), an imperial rye IPA, which tasted of dark fruits and toastiness. Later on, when I drank more of this beer, I got some dankness out of it. Finishing up the flight was the Fat Julian (10% ABV), an imperial stout served on nitro, which featured a nose and palate of roasted coffee, with some slight dark fruits. Okay, at this point, the night was nice and normal. 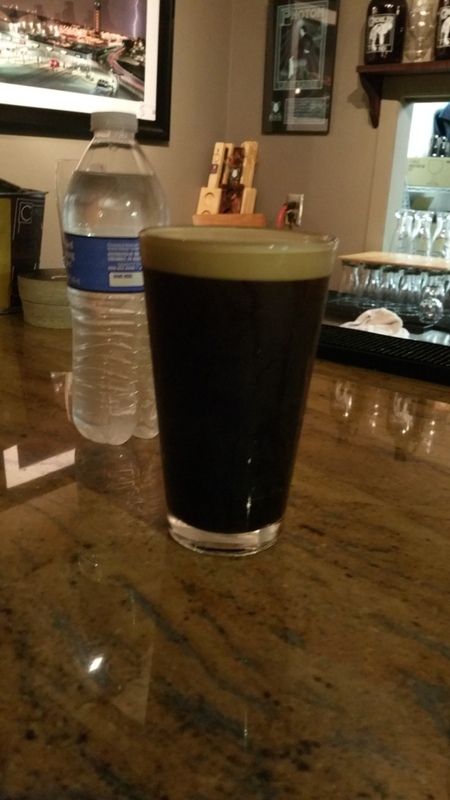 Henceforth, ignore everything below if you want to read about a normal drinking experience at Actual Brewing Company….. Seriously, just stop and read no further. Move on to the next post. Continue to read on at your own risk. 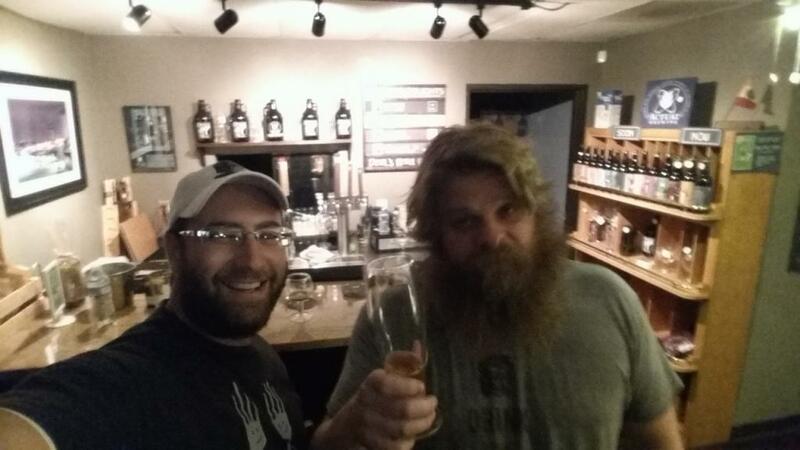 While finishing up the Fat Julian, a big guy with a big head of hair and bushy beard announced that there would be free pints for people who helped unload a van of kegs. Free beer? Yes. So, the other guy at the bar and I jumped to help unload the van. We were then invited for a pint of any beer we so chose. 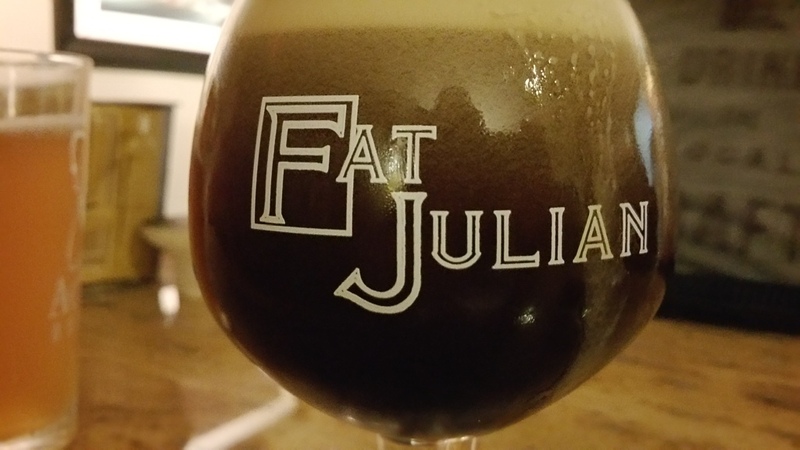 Well, I went with the Fat Julian; I knew I could do a whole pint of a 10% ABV beer, since I just had the one flight of beer beforehand. That was fine until I noticed glassware on sale, including a special piece of glassware that was designed for the Fat Julian and asked the bearded guy serving us beer why the Fat Julian was not served in the Fat Julian glass. Well, he pointed out, it does taste much better in that glass. In fact, he brought one of the special glasses over to contrast the taste of the Fat Julian in the pint glass. It was noticeable. He didn’t stop there: he brought a special glass for the Conductor and it was wonderful in that glass. This bearded man, whom I found out was Fred Lee, an owner of the brewery, said that the Conductor was intended to taste like grilled mango, which, after he told us that, it did! He didn’t stop there: he then brought out two separate styles of pilsner glasses into which Lee poured the Ingenuity into both: wow! There was a remarkable difference in taste between the two – one was not particularly good, while the other was quite tasty. That was great! And we still had a lot of beer to go through. 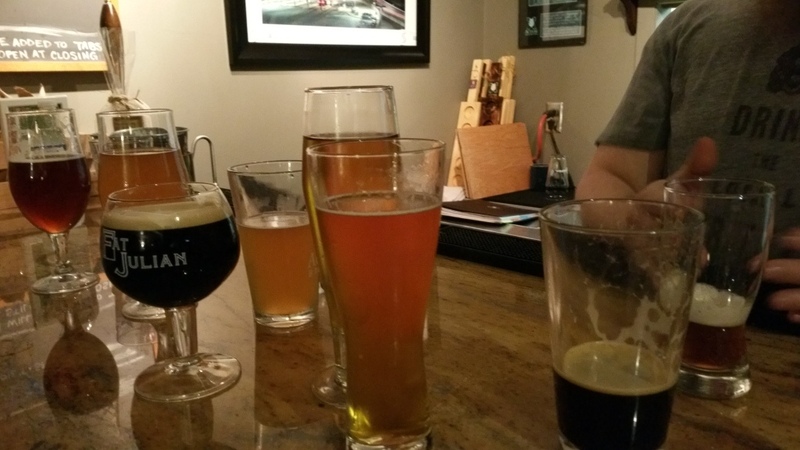 So, while going through these beers in these various glassware, Lee then shared with us brewing and science history, including talking to us about not only the reverse osmosis they do with the water there, but taking it through multiple further steps to get it to be really good. It was really wonderful to be able to hear about how seriously they take their beers, especially from a scientific perspective. 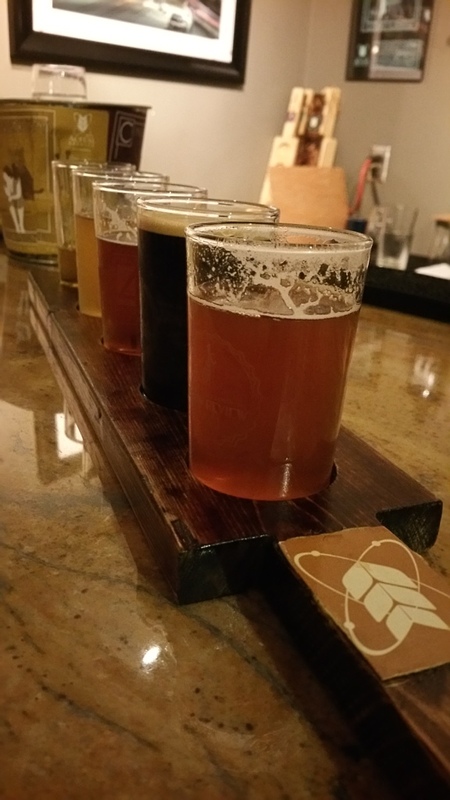 Despite having had only four of their beers, the beers are not only good, but the people at the brewery and the tasting room are really enjoyable. Oh, I have to also mention that they’ve got some sours and bourbon-barrel aging beers waiting in the wings. Also, another cool element about their brewery is that, while they got their yeast initially from White Labs or elsewhere, they have been growing yeast there and are not only on their own as far as yeast is concerned, but are even selling it. 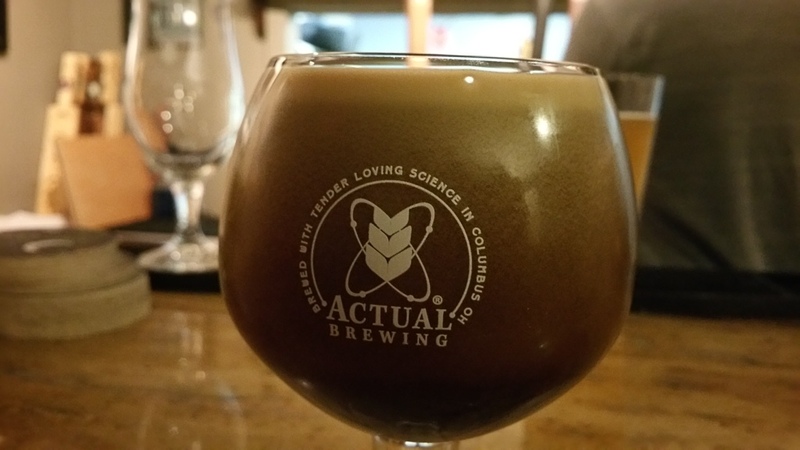 Actual Brewing Company is taking their beer seriously and involving science and they should be really exciting (especially their aged beers(! )).